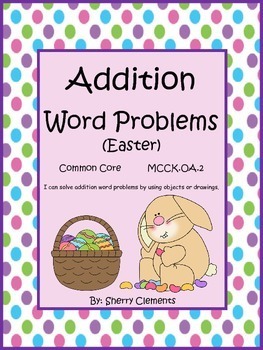 Grab these cute Addition Word Problems for Easter HERE! Addition word problems in this packet are correlated to common core standard MCCKOA 2. There are 15 pages. Each page contains one addition word problem to solve. There is a number line for students to use to solve the problem. An empty box is available for students to draw the matching picture for the word problem. There is also a ten frame box for students to use for counters or for drawing or coloring in the boxes and an equation box containing blanks, a plus sign, and an equals sign. The 15 word problems are about Easter including the Easter Bunny, hiding eggs, hunting eggs, painting and coloring eggs, Easter basket, candy, chocolate bunnies, jelly beans, chicks, and tulips. This addition word problems pack is great for DIFFERENTIATING for your student needs. There are different levels of word problems. Five of the word problems ask for the sum of 2 addends (5+5=__). Six of the problems have a missing addend (4+__=8), and 4 of the problems ask for the sum of 3 addends (3+2+4=__). These levels are great when conducting math groups of different ability levels. Having the 3 addends helps challenge your higher level students.